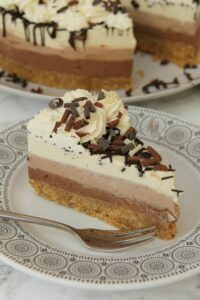 A Delicious and Utterly Divine No-Bake Triple Chocolate Cheesecake – Its perfect for Cheesecakeaholics, and Chocoholics like me! 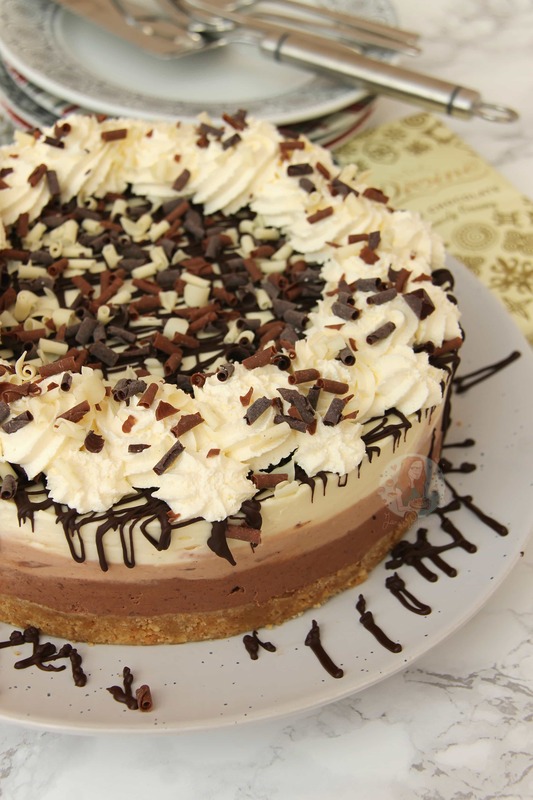 I know I post a lot of cheesecake recipes, and a lot of recipes to do with Chocolate, but like c’mon… they’re the best. (If you disagree, you may be in the wrong place… but anyway!). The lovelies at Divine Chocolate sent me over some of their baking chocolate to try out and I was SO excited. Not only because the package came with a Tea Towel that looked like one of their chocolate bars, but because I have been wanting a reason to post a Triple Chocolate Cheesecake for a good while, and here it was. I based this recipe on ones such as my No-Bake Honeycomb Crunchie Cheesecake and No-Bake White Chocolate & Strawberry Cheesecake, in the sense that I used my typical 2x280g of Cream Cheese (about 550g worth), with some Icing Sugar, Vanilla and some Double Cream to make the base of the cheesecake mix, then split it between three bowls, and mixed in the three different types of chocolate. I will admit, this worked a lot better then I thought it would, and it looked so much better compared to how I thought it would! I liked the hint of vanilla in the mixture, as well as the different tastes of chocolate with each bite. The slight bitterness of the 70% Dark Chocolate, the milky but chocolateyness of the 38% Milk Chocolate, and finally the utterly scrumptious White Chocolate make a dreeeeamy combination for anything Triple Chocolate. I obviously have an addiction to anything Triple Chocolate as I make my Triple Chocolate Chip Crinkle Cookies on such a regular basis its rare my house doesn’t have a batch at any one time. My Triple Chocolate Cupcakes would also work so so well with the Divine Chocolate as Divine also do a delicious Cocoa Powder that you can bake with as well. I was obviously only sent the chocolate to use in a recipe as a goodwill for me and my blog, and I won’t lie, I loved the chocolate. Chocolate is one of those things that is just so loveable in my eyes, and I always looove to stray from my norm and try something new and delicious. If I were to buy bars of chocolate for baking, I would definitely use these. If I could buy the bars in bulk and actually have somewhere to store them then I would also do that too.. but alas, my baking cupboards are way past full now. 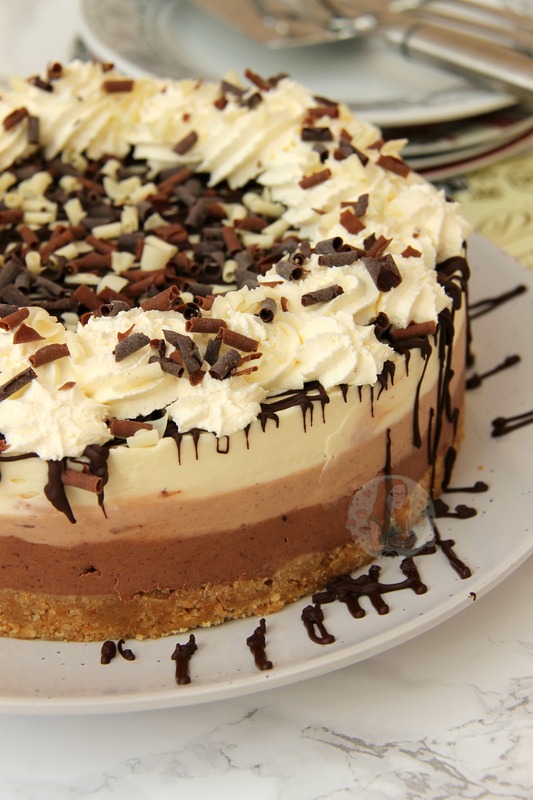 But either way, the chocolate you use will not affect the cheesecake itself. 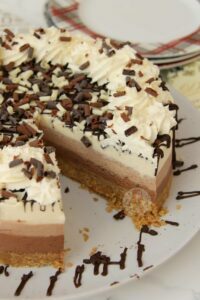 It’s still going to be an easy, delicious, No-Bake Triple Chocolate Cheesecake that is going to impress any chocolate lover, or cheesecake lover alike. 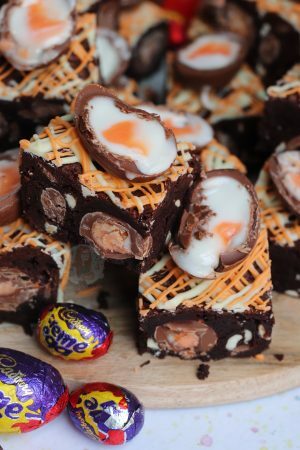 Enjoy this recipe, its definitely one of my new favourites! 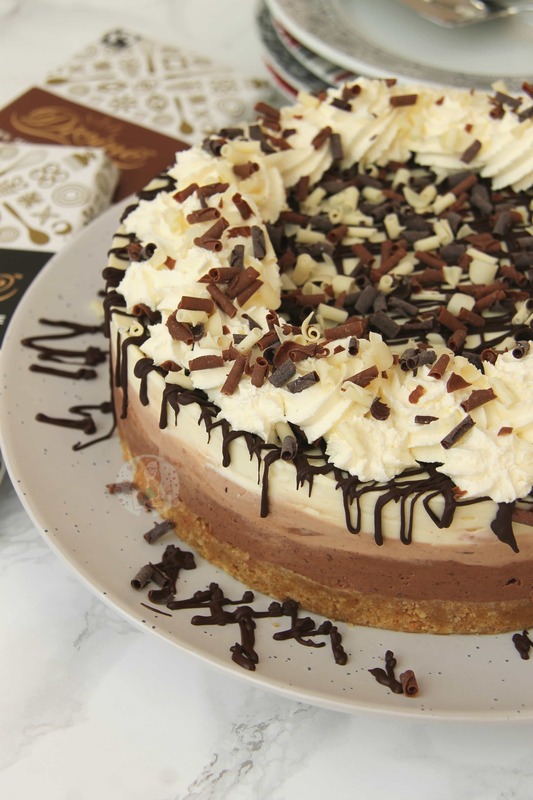 2) To make the Cheesecake Filling – Melt the chocolates in separate small bowls in the microwave microwave on short bursts until fully melted – leave to cool slightly whilst doing the rest. 3) With an electric mixer (I used my KitchenAid) Whisk the Cream Cheese and Icing sugar until combined – pour in the liquid double cream and continue to Whip the Cream Cheese/Cream Mixture until it is starting to thicken a lot like a Mousse does (I use speed 6/10 on my KitchenAid). 4) Separate the mixture between three large bowls (try to be as even as possible, I weighed mine) and pour in the melted chocolate. I melted the Dark Chocolate first, so mixed in the Dark Chocolate first (I did it in the order I was layering, so that its the coolest one first). Fold the mixture together until smooth, and then spread onto the cheesecake base. Repeat the process with the Milk Chocolate, and then the White Chocolate. 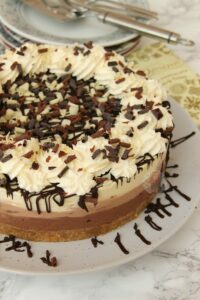 5) Cover the cheesecake and chill in the fridge for at least 5-6 hours hours or preferably overnight to set fully. 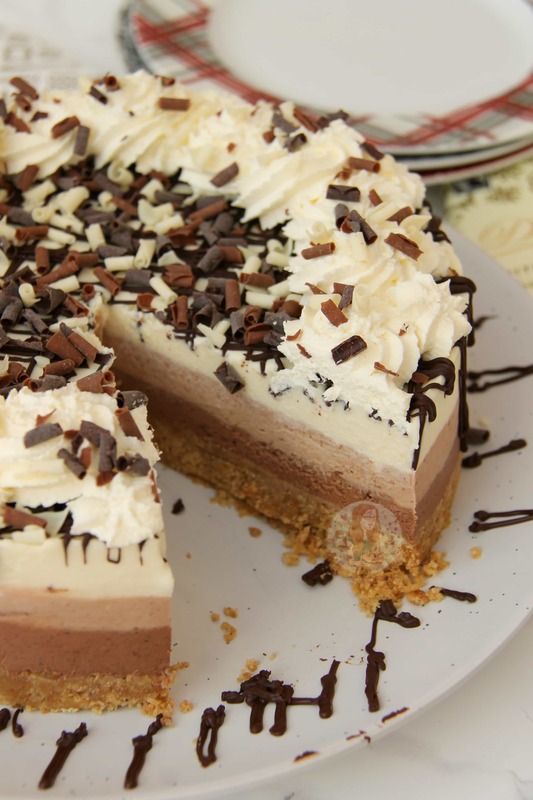 6) To decorate the Cheesecake – Remove the cheesecake from the tin, and drizzle over some chocolate (I went with Dark as it was the lowest layer and looked best) and then decorate with some whipped cream, some triple chocolate curls, or grated chocolate and ENJOY! I used Divine Chocolate because the lovelies at the company sent me some to try out, but you can use any chocolate you like, however, I am biased to Divine because it is so delicious. You can find the website for the chocolate here – http://www.divinechocolate.com/uk/, or in supermarkets such as Waitrose! Any other chocolates such as Callebaut, Lindt, Cadburys etc will work well too! 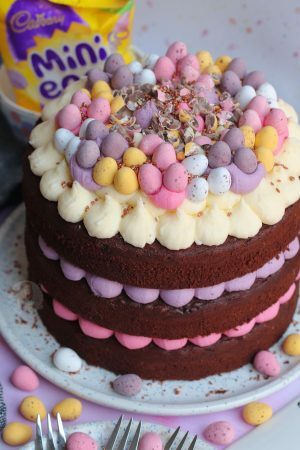 You can use gelatine to help it set if you wish, but for me you really really really don’t need it as the amount of chocolate for the amount of mixture is enough for it to set really well itself. Find my other Cheesecake & Chocolate Recipes on my Recipes Page! Older Next post: Marble Cupcakes! Newer Previous post: Triple Chocolate Cookie Cake! I love this recipe, I’ve recently tried some variations I thought I would share because I thought they worked well, I hope this is ok! I swapped the biscuit base for a broken up Belgian waffle base (still used the butter) which went down really well. 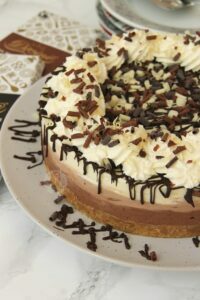 Another time I made it I used the salted caramel recipe and put a layer of it on top of the biscuit before the first chocolate, this went down so well I didn’t manage to get a slice of the cheesecake myself so ended up remaking it the next day so I could try it. Hi. What size tin do you use for your cheesecakes please? Thanks in advance! I wondered if any other chocolate could be recommend to use? I don’t I’m afraid, I’m a recipe blog. Hi Jane, I am hoping to make this in a few days. For your decoration, how did you go about whipping the double cream? 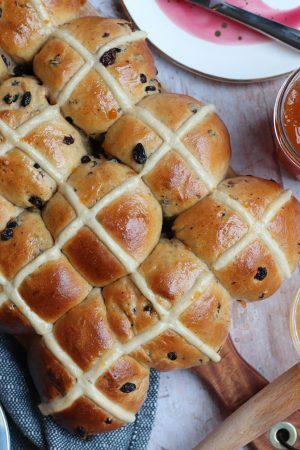 Do you simply whip it or do you need to adding icing sugar or something else to it? Will it stay looking nice or does it go flat after a short while? Hope you can help. Many thanks! You can either simply whip 150ml cream up, or add 1-2tbsps icing sugar to stabilise it a bit more ? as it’s cream you’ve whipped yourself, it shouldn’t go flat. sorry for asking but where does the vanilla bean paste go? In the mixture before splitting into the three. ? Is it possible to make this a couple of days in advance without freezing? Thanks! Yes – it lasts three days once made, so just make it and enjoy it on the day you need it. Hi – is it possible to freeze this? Yes you can – it must set properly first before its frozen. Hahah amazing! 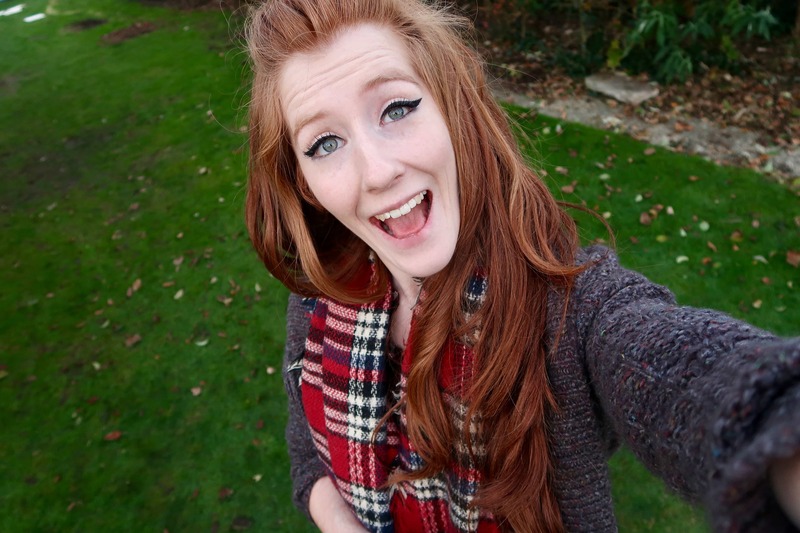 I am so so glad! 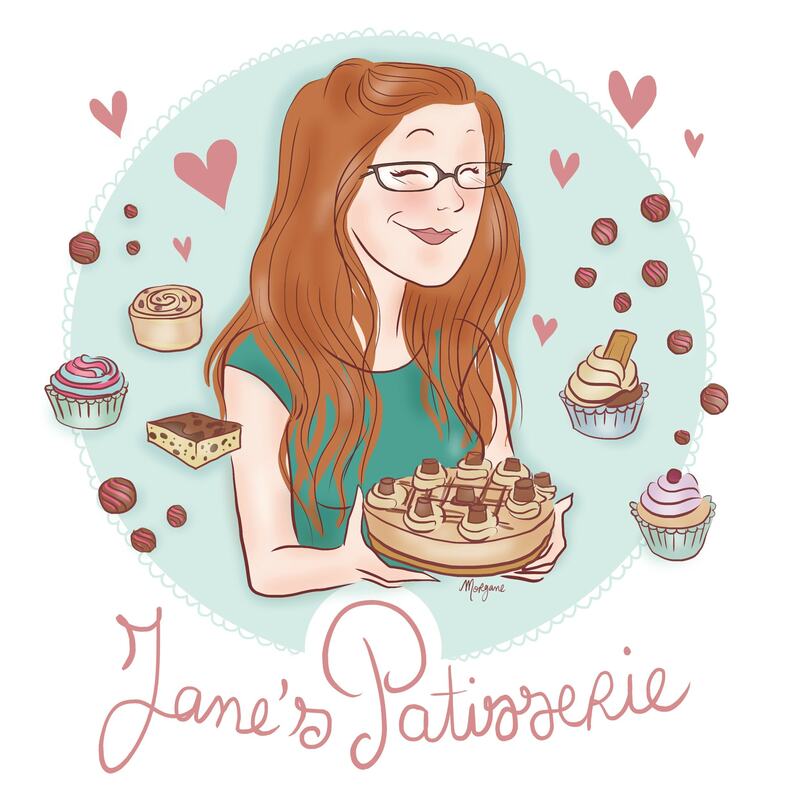 Hi Jane, I made this cheesecake and it was absolutely delicious. I will definitely be making this again. However, when I made it, around the edges were quite messy when I took it out of the tin. What’s the best way to get the edges neat and smooth like in your pictures so you can see the layers better? If you struggle you could use a large disposable piping bag, and cut off the end (about 2cm width) and basically pipe it on. So go around the edges first, and then fill in the middle. Repeat for each layer! Looks fantastic and hopefully will taste as good. Was just wondering whether you need to put each layer in the fridge before putting the exit chocolate layer on? No you don’t, my method as written is correct. But thank you! 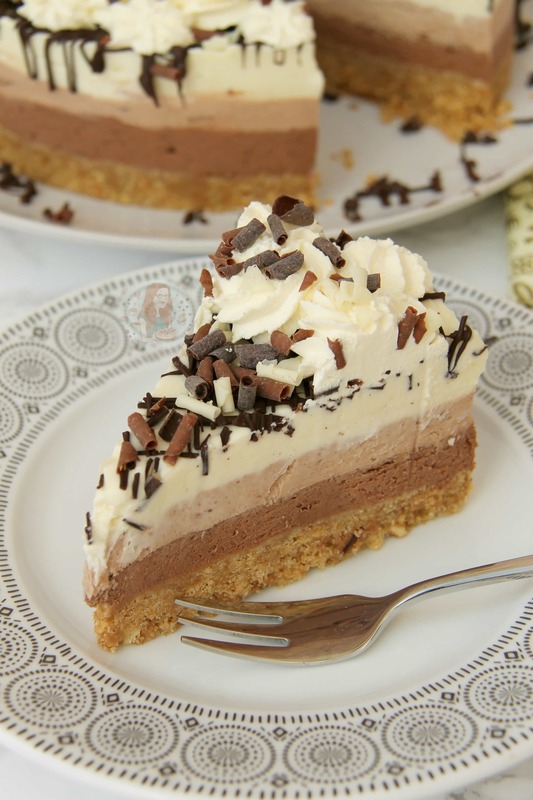 Hi, I’ve just made this cheesecake, but when I added the chocolate to the cream cheese/cream, it went really thick …so I had to add more cream to slacken it down, I found I used twice as much cream, do you think I whipped the cream cheese/cream too thick to begin with? I know this is reeeeally late, but I have only just seen this comment! It should have been really thick so in my opinion you did it correctly the first time? It needs to be thick to set the best, but if it worked with more cream then yay! Hi – I have just made this but when I added the chocolate to the mixture it made the chocolate harden into small pieces. I melted each chocolate before mixing the chream cheese mixture so they were thoroughly cooled as per he recipe. It’s fine cos it will just take like I was meant to put pieces of chocolate in each later! But wondered what I had done wrong? It might be that the chocolate had gone slightly too cool? Like Luke warm is still fine, it just can’t be just melted temperature? It just sounds like as the chocolates touched the cream cheese and solidified as it was really cold already if that makes sense! This looks soooo delicious! I’ve not tried Divine chocolate although I’ve seen it on the shelves, I’ll have to try it sometime 🙂 I usually just go for Lindt! Oh I really recommend it, it’s got a delicious taste ?? Saving this one for my birthday party! Thanks! Ooooh yes, perfect Birthday treat! Thank you!